As of July 16, 2018, Google has consolidated their services, including their API keys and a new pay-as-you-go pricing plan that has gone into effect for Maps, Routes, and Places. Google’s new pricing and terms of service require everyone who has an API to sign in to Google and enable a billing account. 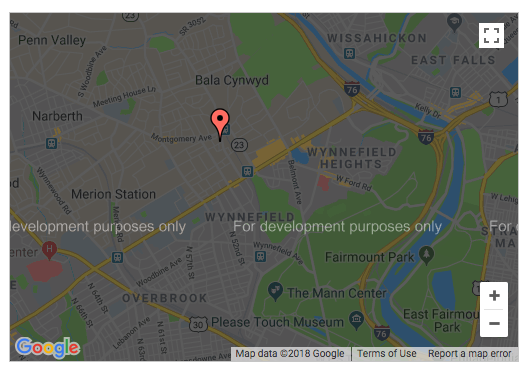 The 18 individual APIs that Google Maps offers are now consolidated into three broad segments – Maps, Routes, and Places. You can no longer use the APIs unless you create an account and set up your billing information with Google. This is applicable to all users – even those who have a simple map embedded on their website’s contact page. When you set up a billing account, Google will give you $200 monthly free credit, free Maps usage for iOS, Android, and Embed (for displaying Maps only), 24-hour Google customer support and free Maps URLs. The Standard and Premium plans are being merged into one pay-as-you-go pricing plan. For most small businesses, the new fee structure will not affect your pricing if your usage stays at its current level. You can continue using Maps, Routes, and Places for free, as it is covered in Google's $200 free monthly credit. 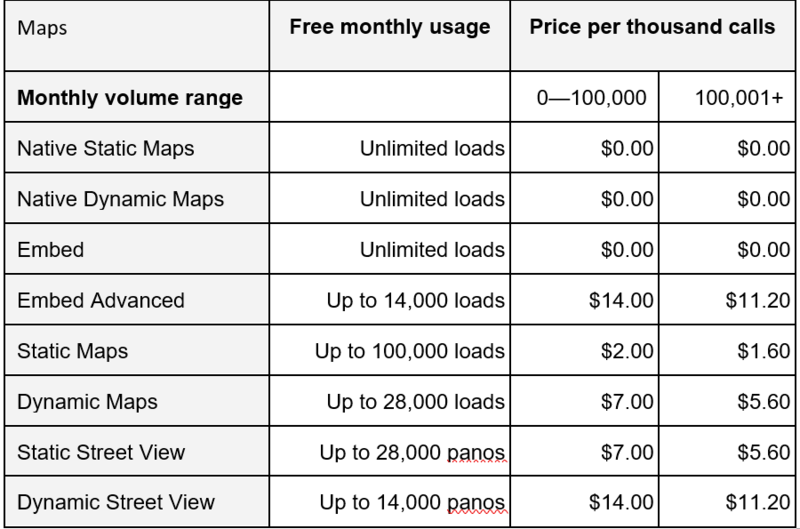 But for users with Dynamic Maps or Static Street View Maps, the complimentary $200 will only take care of 28,000 free Map requests per month. To avoid being charged, you will need to keep an eye on your monthly usage. This billing chart shows the new fee structure. You can review rates and access your spending any time in your Google Cloud Platform Console, where you can also set daily quotas to protect against unexpected increases. Alerts will help you manage and monitor your usage. Depending on your user status, there are different actions we can take to get your Google Maps up and running. Users can be broken into three categories: Premium Plan Customer, Standard Plan Customer and Keyless. Premium Plan Customer – There is nothing you need to do for your Premium Plan. Your account will by transferred to pay-as-you go pricing for you. However, existing Premium projects cannot be transferred. You will need to create a new project with new API keys, and use them to to replace your existing keys. Quick tip: Additional projects not covered under your Premium Plan will require manual Maps API implementation. Standard Plan Customer – If you are a Standard Plan customer, you must connect your API key to a Google Cloud Platform Console to ensure your projects are secured and fully functional. Keyless – You must have a valid API key and a billing account to access your APIs. 4x3 can assist you and your company with navigating the Google Maps Platform Console and configuring your API Key. Creating custom Google maps has become a 4x3 specialty; contact us for assistance. We build and integrate Google maps into mobile and desktop websites. Our Drupal-based Web platform allows for sophisticated multi-layer, interactive map features that enhance website usability, social integration and local SEO.